As a new start business there is a lot coming at you. The aim of this seminar is to help you focus on the key areas. 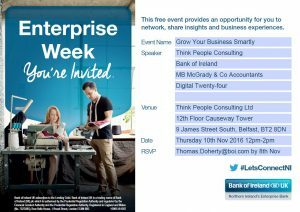 Hosted by BOI, on 10th November from 12pm – 2pm (Think People Consulting Ltd, 12th Floor Causeway Tower, 9 James Street South, Belfast) as part of Enterprise Week, the seminar will guide you on the 3 key challenge areas of people, finance and marketing. It’s a focused presentation to pinpoint essential tasks in each area. RSVP by 8th November to Thomas.Doherty@boi.com. We look forward to seeing you there.